A feature of F1 for many years were the vapour trails spiralling off the rear wing tips. This phenomenon largely disappeared a few years ago, but was apparent once more on the rear wings of the McLarens at the recent damp race weekends. So what are these vapour trails and why do McLaren tend to create them more than other teams? They are in fact more correctly termed ‘vortices’, they are created when the pressure differences are created at the wing tip. As you get high pressure above the wing, low pressure beneath and near ambient pressure to the side of the endplate. When these three flows meet, the higher pressure flow naturally moves towards the low pressure areas. This sets up a tumbling motion and a spiralling flow structure is created. As we know from the aerodynamicists use of vortices to shape and alter flow over other areas of the car, vortices are extremely high energy structures. But with them comes a lot of drag. These wing tip vortices rise upward and outward from the rear wing tips and eventually flatten out behind the car as their energy is dissipated in the free stream flow around the car. The greater the pressure differential, the greater the vortex created, and this is generally seen better in damp conditions as the water in the air concentrates into the vortex to become visible as a vapour trail. In years gone by, the site of vortices spiralling from wing tips was seen as a good thing, as the belief that the wing is working hard. To some extent this was correct, with a simple wing the fact that it can create visible vortices did prove the wing was highly loaded. However the drag that it created was less well understood. Since the early 2000’s teams have sought to reduce this pressure difference at the wing tip, in order to reduce drag. Several solutions have been tried to alleviate the pressure differences at the wingtip. As F1 rear wing have such small aspect ratio’s, (width versus length), there’s little that can be done to reduce this high pressure created towards the endplate without sacrificing total downforce created by the wing. 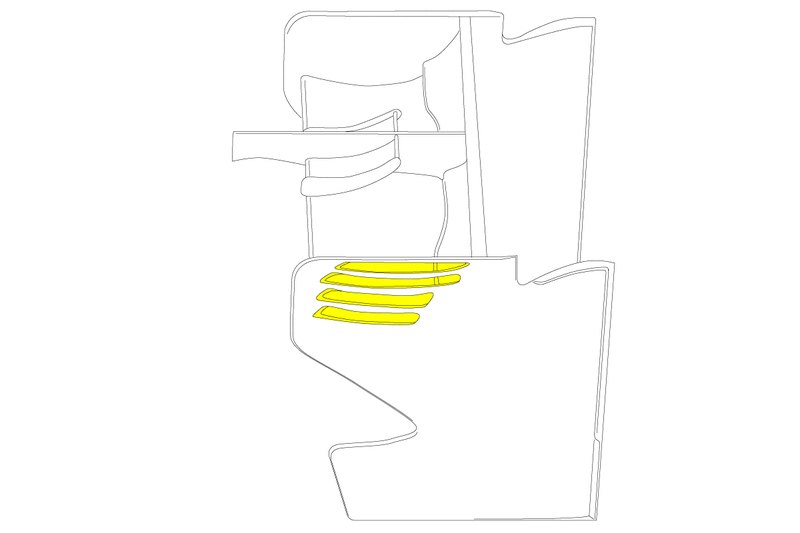 Teams have experimented with twisted wing profiles, reducing the angle of attack of the wing cross section nearer the endplate, to reduce the high pressure created above the flap. But this in turn reduces the downforce created by that section of wing. At tracks where lower downforce is required, teams will still ease the loading of the outer part of the wing, centering the pressure distribution in the middle of the wing. The other option is to allow the whole span of the wing to be aggressively steep, but use other methods to reduce the pressure difference at the wing tip. Firstly teams such as BAR created a cut-out in the end plate ahead of the flap, this allowed some of the high pressure above the flap to bleed off outside the flap, negating the pressure difference and therefore the strength of the vortex. 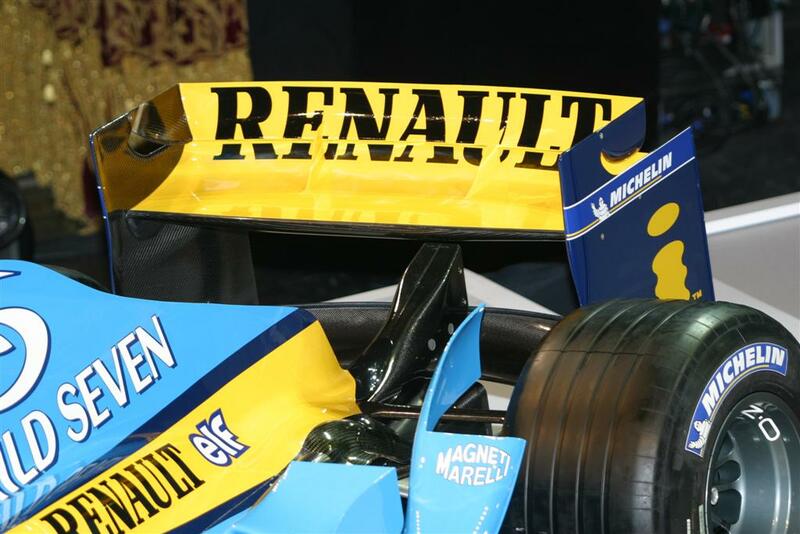 But this was a fairly blunt solution, so teams created the now-common louvers in the endplate. This solution directs some of the high pressure air above the wing to the wing tip in a more elegant way. 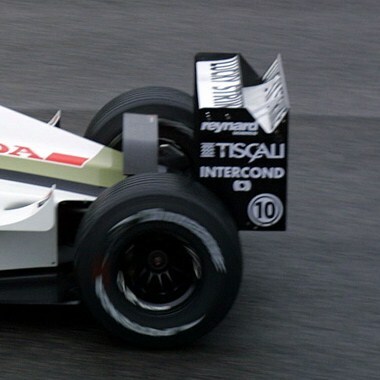 Renault, then latterly Honda and McLaren created a different approach by merging the flap into the endplate, this creates a small gap to direct the high pressure flow to the wing tip. In the past two seasons reducing this effect has been negated somewhat by other means to reduce the rear wings drag. In 2010 the F-duct allowed the driver to reduce the rear wing downforce and therefore drag. In wet races in 2010 we saw the McLaren’s exit a turn, as speed built up the vortices would appear, then as the driver closed the cockpit control duct the rear wing stalled downforce\drag was instantly reduced. As the driver did this, the vortices also disappeared. This allowed us to see just how soon the F-duct was engaged out of turns. With the F-duct banned and DRS allowed for 2011, teams are able to adjust the rear wing in qualifying and for overtaking in the race. Depending on the teams qualifying\race strategy, they have redesigned their rear wing to have a different flap size. A small flap, means that the DRS effect is larger, more downforce and drag are shed for more top speed. However the smaller flap means that the rear wing is limited in the downforce it can create, as the sot gap is further back on the wing and separation is likely with aggressive angles of attack. Most teams have followed a design path that errs on this level of DRS effect. As the wing tip is not loaded so highly, there are few vapour trails created. McLaren however have been almost alone in creating a DRS wing with a large flap, this creates the opposite characteristics of a small flap wing. Less DRS effect is created, but the wing can create a larger amount of downforce when DRS is not activated. Thus their rear wing is steeper and more heavily loaded at the wing tips. 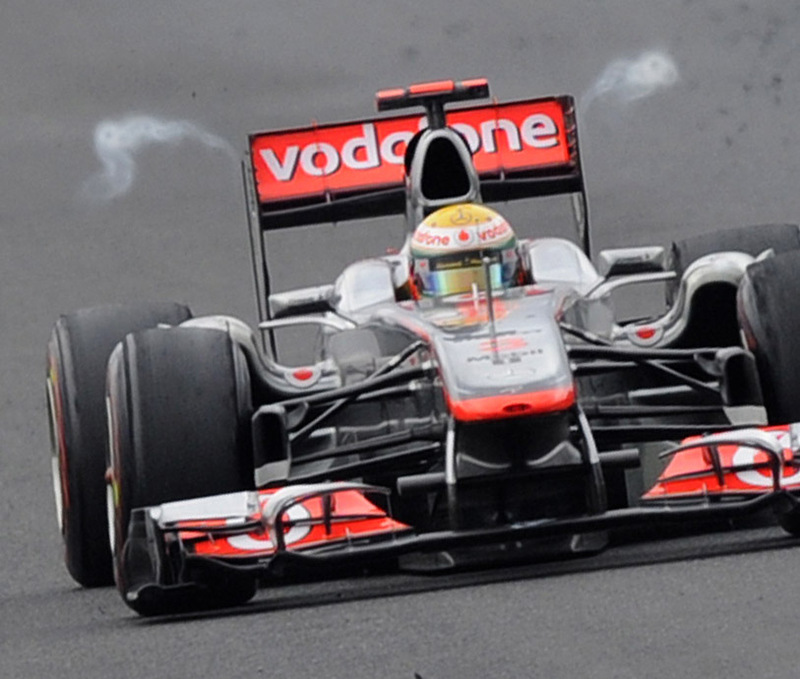 Its for this reason that McLaren tend to be the team in 2011 that create the vapour trails on damp days. McLaren do however have a small flap DRS wing in development. We can expect this to create less trails than their current if it gets to be run in the damp. This entry was posted in 2011 Rules, DRS - Adjustable Rear Wing, F1 2011, McLaren MP4-26 by scarbsf1. Bookmark the permalink. You recently mentioned F1technical forum as theundoubtedly nr. 1 but you sir are The reference as technical analyst! So the implication is that Mclaren generate much more peak downforce from their rear wings than other teams – and yet we’ve seen them at or near the top of the trap speed charts quite regularly. Does this then lend some credence to the theory that their L-shaped sidepods cause the chassis to generate much less drag? Very interesting approach Mclaren has taken this season, it’s really great to see them pushing the envelope! I’ve been interested to see the Vortices coming off the front wing endplates on the Red Bull this year. I don’t ever recall seeing this on Front wings, just goes to show how much downforce red bull are producing at the front! Interesting to see that the vortices are not coming from the top flap, but from the main element. I haven’t noticed that before. So I would say that they have the pressure differentials worked out for the top flap, but there isn’t a lot of room under it to work out the differentials created on the main, or the end plate design isn’t working quite like they would like. Is it not possible that the visible vapor is caused by a rapid drop in temperature (caused by a rapid drop in pressure) so the water vapor partial pressure exceeds (or comes very close to) the equilibrium saturation water vapor partial pressure at that lowered temperature? Might McLaren be deliberately creating rear wing vortices to “dirty” the air leaving their car so that overtaking is more difficult for a following car? Or do you think that it’s not worth incurring the increased drag of these vortices to upset the following car’s aero? Very good stuff keep it up Craig. Excellent work as always, I’ve featured you on my website http://literalf1.com/ You really show the power of social media in one way because I don’t think the great access to F1 we have now would have been possible people like you. Thank You. Good explanation. In 2012 even Force India has these louvers. Pretty cool feature. I just need to find out how to install it in my hybrid.